Worlds Largest High Precision CMM & Gear Inspection System - CMM Inc. The Leitz PMM-G is a gantry style coordinate measuring machine (CMM) with the largest and highest precision accuracy in the world. 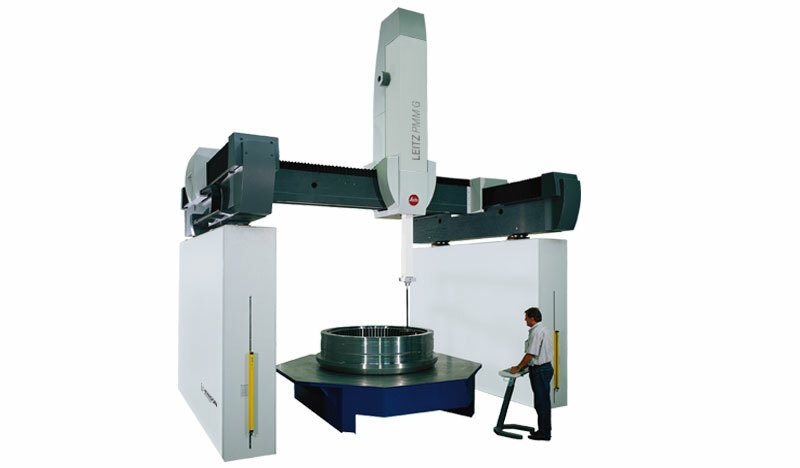 The system is capable of measuring large, tight tolerance parts – for example, typical parts measured on the Leitz PMM-G include: large diesel engines, jet engine components, aircraft wing structures, columns of printing machines, satellites, large machine tool parts, and many windpower components. Despite such large measuring strokes, the Leitz PMM-G reaches a precision and performance level, which is usually common with much smaller 3D measuring machines. The x axis is built with dual driv emotion systems and transducer systems. The Leitz PMM-G also features the Leitz LSP-S2 scanning probe system. Styli configurations of up to 800 mm and 1000g are possible. The Leitz PMM-G series can also be used for large gear inspection; it offers fast and precise inspection of gears and gear cutting tools up to a diameter of 5000mm. Also, it does not require a rotatory table for gear inspection and as a result, alignment or centering of the gear is not required.